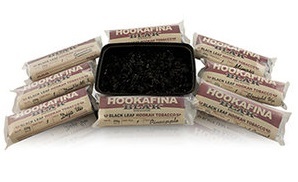 Hookafina Blak Premium Flavored Tobacco is back at it with their most recent batch of tobacco. The first batch was rather heavy on the tobacco notes and had a noticeable green dye that didn't go over well with the consumer but the most recent batch is dark in color, like other fine cut dark leaf tobaccos on the market, and they toned it down on the strength of the tobacco notes. The result is a perfectly balanced mixture that highlights the darker notes of pipe tobacco without overpowering the main flavor profile of the blend. Hookafina Blak is made in the United States in LA and they took it old school with this formula. 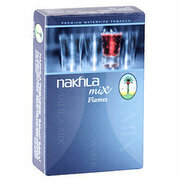 It consists of raw tobacco leaf mixed with dark molasses made from pure sugar cane to produce a full bodied blend of Hookah Tobacco not intended for beginners due to its high nicotine content and buzz inducing qualities. It is first cut by hand into small strips and then mixed with dark molasses under pressurized heat. Finally, the flavors are added to the mixture and left to acclimate. Hookafina Blak has a nice variety of dark note flavors to choose from and their 250 gram jars allow for Hookah users to smoke several times a month or with large groups of friends. This size is packaged in a way that it is not resealable so make sure to store it at room temperature in an airtight container so that it is sure to maintain its freshness. Hookafina Blak is fairly juicy so it is at its best packed into a phunnel bowl. It is a higher nicotine content tobacco and is a finely cut dark leaf so it can be packed dense to control the amount of nicotine intake per draw but has the best flavor results when it is packed at a semi-dense level. Just sprinkle it in and add a fair amount of extra tobacco before nudging it down to a semi-dense level that still has some airflow and buoyancy. It takes heat very well so don't be hesitant to start with 3 hookah coals and work your way up accordingly depending on the size of the hookah bowl.